We are back from summer and on to a wonderful school year! With two weeks down and fourteen to go, we are an eighth of the way done! Woohoo. Our annual summer camp went swimmingly; we had between nine and 15 students every day and it was an awesome experience for everyone who went. Everyone got to either learn a new form or hone skills of a previously known one. There is always so much grown and learning (and pain) gained from going to camp; if you have not been able to go before, you should definitely think about it for next year! Our semester has been booming from the beginning! Our first class had an even number of returning members and new students and our second meeting had more beginners then returners! Wow, what a milestone! Our third class was on Labour Day so wasn’t an official meeting and our numbers dwindled but this last class back up to more then half and half. This last class was also “Bring a Friend Day” as well as the Demo Day and I think everyone was quite impressed with our awesome skills. I am happy to see so many excited returning newbies and hopefully they will make it through a whole semester. A note to new students; don’t forget to eat bananas, spinach, beans and other things to help with the soreness! Stretching every day, even for a little bit is also going to be a hugely beneficial habit in the long run! Next Saturday, on the 13th is our first (hopefully) annual Challenge Course run. It will be $30 to participate weather you are a student or not but I need liability waivers signed so if you are interested, please talk to me so I can get those for you! Money is due to Ronnie, so talk to him about when and how to get that to him. If you are going to the challenge course, please remember to bring a water bottle and dress for the weather! I’m not sure yet weather it will be rainy or sunny or if a tornado will strike so dress in layers and be ready for anything Flagstaff can throw our way. We will be there from 1-4PM and if you need to know where the Course is, let me know! The last big bit of news: Dusty is in Costa Rica! As everyone should know by now, she was asked to compete alongside the American Wushu Team at the 10th Annual Pan-American Wushu Tournament. So far, we have heard about one silver medal she has won for her third compulsory chang quan performance. This is such a huge honour and achievement so make sure you congratulate her when you see her next! Also, tell all your friends that that awesome person was our founding coach and, by lineage, you are also awesome. I also wanted to publicly apologize for the few posts that went out last semester/year. I will do my absolute best to send out more posts and keep everyone updated on the goings-on of the team. I hope everyone has had a good first two weeks and is ready to keep up the great work! PS; Ronnie will be doing a shoe order this coming Friday. The price has been raised to $25 to cover the increased shipping from the site. If you are interested in buying Feiyues let him know. If you are interested in having them dyed, make sure you get white from him and let me know what colour you’d like! Now that we are about a month into summer, I hope to hear that everyone is still practicing hard! Of course, summer is also a time to relax and have fun, so don’t over do it or break yourself. That is what Camp is for. Speaking of which, the 5th Annual NAU and Jade Moon Wushu Camp will be held from August 18th – 22nd. A location and specific times are still being worked out, but make sure you get those nights off if necessary! We have had a seriously awesome school year guys. We sent a few people all the way across the country for Collegiates, we had five team mates graduate, we had five new Senior Students and two new members added to the officer board. What a year it has been, indeed. Four Jade Moon (And NAU Alum) members went to the Golden State Tournament last weekend. In total they came home with four 1st place and two 2nd place trophies! Awesome job Dusty, Lianna, Jessica and Hannah! We are so proud of you guys. The next tournament is Las Vegas from August 1st-3rd so if anyone is interested in competing, start talking tot he Coaches now. We hope to see a strong set of athletes compete for our schools. Last but not least, I would like to alert everyone to Coach Dusty’s wonderful opportunity. She has been asked to compete at the 10th Annual Pan-American Wushu Championships in San Jose, Costa Rica. That is a MASSIVE honour that, quite unfortunate, comes with just as massive a price tag. So we ask that anyone who can donate anything at all, whether it is only a dollar or twenty, do what they can to help her with this amazing opportunity because not only will she be representing the US, she will also be representing Jade Moon and NAU. More information as well as the ability to donate to her fund can be found here. With all of that being said, I hope that everyone has a wonderful summer. More information about the summer camp will be released as it is known and we hope to see everyone there! Wow, it has been an awesome beginning to an awesome Spring semester. We have had about five consistent new members which is wonderful; adding people to our ranks will make us a better army (evil laugh). Friends have been made, compulsories have been learned, and demos have been performed. We are only about six weeks into the semester (OHMY it’s almost midterms!) but we have kept so busy! Two weeks ago was the Chinese New Year Festival and some of the NAU team members went down to the valley to help Jade Moon with their week long performance of demos and lion dance and dragon. It was exhausting and a ton of hard work but BOY was it a blast! The Chinese New Year Festival is something we always try to go down and perform for but this year it was huge and a much bigger deal then in the past and we are so glad that we could be a part of the experience and that our parent school welcomed our help with open arms. And oh yea, HAPPY YEAR OF THE HORSE! Last week a small group performed at the Kjack Live Arts Festival and got a huge arousal from the crowd. They LOVED the chain whip and sparring set. Way to rise the appeal guys! Saturday was a super busy day because before the Live Arts Festival, we had a day long ‘Competition Prep’ with Sifu Long and Sifu Houwangzi. I think it’s safe to say that everyone who stopped by benefited in some way from their awesome ideas and assistance. Thanks Jade Moon Coaches for being so dedicated to the NAU Team and donating your time to help us out! Next week is our Di tang Seminar. Sifu Long will be traveling all the way back up here to teach us how to fall correctly as well as ground techniques and lots of super fun fundamental things that will really benefit everyone’s Wushu, no matter how new they are to the art. Because this is a class and not a practice, we do ask that anyone who comes brings a donation of $15 or $20 to help cover for the Coach’s time and gas. The seminar will be from 10am to 2am with a lunch/break somewhere in there. We will be in the Rolle Activity Center (the same room the Classic was in) so stop by and learn some stuff! The next big bit of new are our tournaments. Berkley (March 15) and Collegiates (April 19). Travel and hotel have been priced out and of course, everyone is more then welcome to choose their own hotel and airline but the more we stick together, the cheaper it will be. Berkley has been priced out to relatively $170 while Collegiates stands at about $420 (of course plane tickets for Collegiates will only go up). Unfortunately, ASNAU has lowered the amount of money they will re-reimburse to clubs so there is no way to get full re-reimbursement for Collegiates. That being said, if you are interested in either tournament, please talk to Genevieve right away! Last bit of events (not nearly as big as the a fore mentioned ones) are some of our little ‘parties’. An ‘Anti-social Party’ will be held at Sean and Ronnie and Robert’s apartment on March 8th from ‘whenever’ to ‘whenever’. Probably starting around two or three, just show up, bring your laptop or video game or book and be anti-social with us. Next up is our ‘Team Building Party’ where we will play tons of fun ‘ice breaker’ and ‘team-building’ activities and just have a general fun day! Location is not set yet but it will probably be in the Gabaldon or WAC field. After that is finals and our Spring Banquet! The date for the Banquet hasn’t been set yet so keep an eye out and we will let you all know where that goes! (If you need S/R/R’s address or wish to be invited to any of these events on Facebook please message Sousa). I will also be updating the donate button here on the site and I will also be adding tons of pictures from the last Banquet, the Classic and the semester so far in the Multimedia section. If you have any pictures you would like me to put up, please let me know and we can discuss how to get them to me. Last but NOT least, we will be starting the Student Spotlight back up again so keep an eye out for that! And without further ado, I bid thee, good night! Wow! It has been one seriously crazy semester folks. I’m sorry for not getting an update sooner but you can expect to see them monthly starting next semester. There’s a lot to discuss now, so please bare with me. Our semester has been busy busy. We were off to a quick start with big classes, sometimes we broke down into four lines and got through basics quickly. There was a period where we would condition between lines which was tiring but really helped to keep people focused and on track. The BIG news, is the Jade Wushu Classic. Held on the 7th, this last weekend, we had 21 competitors and saw 31 performances. It was a full day of fun and hard work. First, I would like to extend a massive THANK YOU to our five judges: Coach Houwangzi, Coach Long, Coach Jake, Coach Dusty and Coach Tiandao. Without your dedication and expertise, this tournament would not have been possible. Our tournament opened with a wonderful Lion Dance by Dusty and Lianna. Following that was a Master’s Demo where Coach Long and Coach Dusty performed strait-sword and eagle respectively. Then we had the beginner, intermediate and advanced devisions, followed by a few fun competitions. The days was not over, however, because a fter a few hour break, the end of the semester banquet was held! There was food, there was pictures, and there was even a new game invented (talk to Coach Long, Wushu Pool is a real thing now). Without further ado, I will announce the scores of the tournament! CONGRATULATIONS to all of our winners and to our beginners who competed for their very first time. You guys are amazing! Video was taken of (nearly) all of the performances so if you are interested in having a copy of yours, please talk to Sousa, otherwise, they will be posted on Youtube soon. Coming up next is our Winter Break. but just because we have no school doesn’t mean we should be training. Open a present in a scale. Eat Christmas dinner in horse stance without a chair! Be tough, because when we get back from break there is no ‘get back into it’ session. It’s Collegiates training time! Speaking of which, Collegiates this year will be in Maryland, so start saving up and be on the lookout for more information about that in the near future. In addition to our busy semester of training, the officers have been hard at work behind the scenes. A new ranking system has been set up so if you are interested in ranking, please speak with Coach Genevieve. The officers have also created our very own Wushu Team banner that we can bring to competitions and we will be tabling next semester to try to bring in new members. There is a lot of great stuff planned for next semester including a few more prophet shares so keep your eyes peeled. We also have a t-shirt design going for a team shirt. The deadline for entrees is the first week of the Spring Semester. Alumnis are welcome to put in a design! The more the merrier. Last, but obviously not least, we will be subtracting one from our number as this semester comes to a close. Hannah, our beautiful Northern Green Flower Cat will be graduating and moving back to the valley where she will be starting a Wushu club at ASU. She will be walking on Thursday December 18th at 3PM in the Sky Dome, so be sure to be there to support her! Ok, I believe that is all for now. Remember, the updates will be coming more often next semester so be sure to check in often for announcements and updates! So I am happy to say that a new semester has started up and we have a good handful of brand new team members who have been joining us consistently for classes. We also have a great deal of older faces returning to us as well. So far, the classes have been massive – so large, in fact that on Wednesday we did warmups and basics in three lines! Classes are going to be held Monday and Wednesday in the Filed House from 7-9. We officially have a tennis court reserved for us on Monday at this time, however Wednesday is still open court. If you are the first one there and there is an open space, CLAIM IT. Once we are there, we cannot be kicked out. The Field House closes promptly at 9:00 so we need to make sure to get out of there as quickly as possible. So in order to try to keep on their good side, we are going to try to start closer to 6:55 so we can get out five minutes earlier. The six day training camp was held the week before school started back up. There was a decent amount of students who came throughout the camp. The practices were intensive but wonderful. 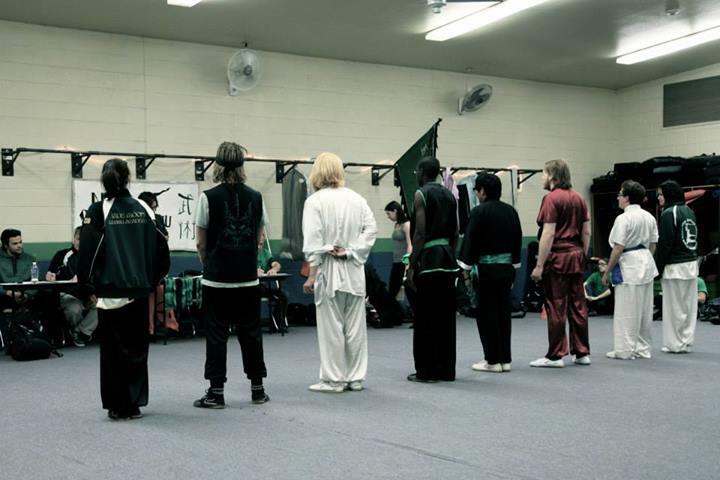 After the initial soreness, everyone started to get better with their Wushu. Some students learned the Compulsory form in four days, others learned the staff or swords compulsories. It was great to be together with our graduated members. The first team order of the year is being placed. Be sure to get your money and information to treasurer Ronnie Hudson by Friday! A weekly conditioning class as well as a weekly Nanquan class is currently in the works. Keep an eye out for information on those in the very near future if you have interest in them. Extra practice sessions are being held almost daily so also keep an eye out for those or post if you are going to be practicing and want some company. Well. That seems to be everything I can think of to discuss! I would just like to say WELCOME to the new students. Everyone thought that things would slow down after collegiates but they were wrong! Things have been just as crazy. And just like the time since collegiates, this post is gonna be super crazy so bear with me! We also had three Group Sets compete which was amazing and our themes got huge crowd reactions. There was no break between Collegiates and Banquet as four team members practiced coaching in a 30 minute and 45 minute section. Jessica Barroga, Genevieve Burns, Andrew Stebenne and Cheyenne Bramwell all did amazingly well and each brought a little something new and exciting to the practice. At Banquet, we had many new awards to be given. Logan Seckinton, Andrew Stebenne, Genevieve Burns and Robert Whitefield were awarded their Blue Level ranks. Ronnie Hudson, Naomi Blackwell, Robert Whitefield, Robert Lutton, Hannah Eaton and Genevieve Burns were awarded their Senior Name and Status. In addition, Lianna and Dusty’s names were modified. Also at Banquet, the new officers were revealed. Good job to everyone who ran! Finals week is a a time when stress needs to be released and fun needs to be had! Lion Dance practices have been going strong and there are many interested members. The team is also doing its best to power through the 108 basics during the last two practices. This last week of school brings heavy hearts as we say goodbye to those who have been with us since the beginning. The team will be different without you, but we hope to grow into something you can be proud of. Thank you for all of your help and love and we will miss you in your absence.